This happened about 20 years ago. I rarely speak about this for fear of being laughed at or just being crazy. She said, “Look up auntie” and there it was a disc shaped hovering above us seem to be following me on the highway; I slowed down to a crawl. I just couldn't believe what I was seeing I tried to wake my husband up but he wouldn't wake up I punched him with a lot of force he just wouldn't wake up to see this incredible sight that we were seeing, my niece and I.
I turned my cars lights on and off on and off like in a sequence, I remember close encounters, so hey maybe lights will work like music, well it did—the light blinked on and off, copied everything I did. I listened for a motor sound of some sort, I heard nothing. It was hovering and flying above me as I drove slowly on the highway; in a blink of an eye it was gone, lighting speed gone! No airplane or helicopter could ever do this. I was dumbfounded … did I just make some sort of contact with an out of this world intelligence? I remember this like it was yesterday; my niece also. We often speak about this to each other. My husband woke up after the UFO left, strange huh?! 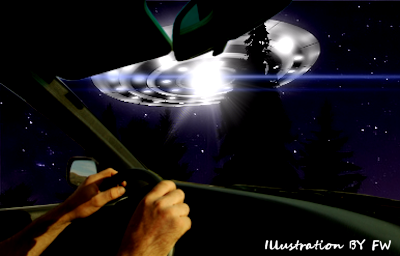 The UFO was about a 100 feet above me with bright lights underneath; it illuminated my side of the highway it was truly one of the most awesome experiences of my life.